KIEV (Reuters) - Ukrainian President Petro Poroshenko said on Thursday he would call on Russian President Vladimir Putin to rein in pro-Russian separatists when the two men meet next week and told the Kremlin chief he had "a strong country, a strong army" behind him. Poroshenko spoke as government forces, despite taking heavy losses themselves, thrust deeper into rebel-held territory in Ukraine's Russian-speaking east and kept the separatists whom they have battled since April on the back foot. 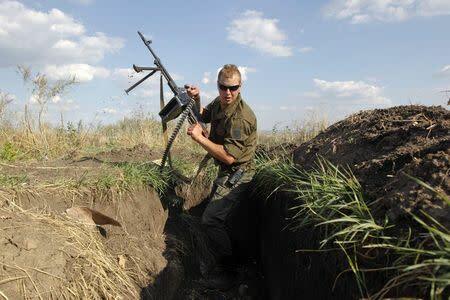 The Ukrainian battlefield successes, after a faltering start in April when government forces were humiliated, have alarmed some Western governments who fear they could box Putin dangerously into a corner with no way out to save face. 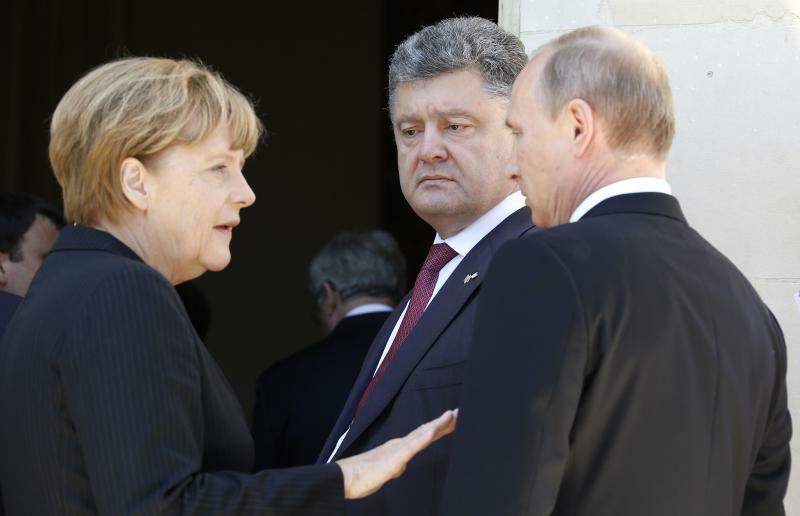 German Chancellor Angela Merkel is scheduled to visit Kiev on Saturday to show her support for Poroshenko - but diplomats say she is also bearing a message that he should consider calling a ceasefire so as not to incur a backlash from Putin. Poroshenko, who will oversee emotion-charged Independence Day celebrations on Sunday in Kiev in which veterans from the eastern front will take part in a military parade, talked tough on Thursday. Indicating he too had a political image to defend at home, he told local journalists that in talks in Belarus's capital of Minsk next Tuesday, at which he will meet Putin, he would "call for the (rebel) fighters to be withdrawn from Ukraine". "I am sure we will succeed in this," he said. Kiev, supported by the United States and European allies, says Russia has orchestrated the separatists' rebellions in the Russian-speaking east, and armed them. Moscow denies this. At the table in Minsk will also be Putin's partners in the Russian-led Customs Union, which beckoned unsuccessfully to Kiev to join, and a three-person delegation from the European Union, with which the new Kiev leadership sees Ukraine's future. It will be the first meeting between Poroshenko and Putin since a frosty encounter in June in Normandy, France, and has raised prospects of a breakthrough to end a months-long geo-political confrontation as Ukraine has favored integration into mainstream Europe to the dismay of its former Soviet ruler. The steady drip of government losses continued, with a military spokesman saying 16 members of Ukraine's interior ministry special forces had been killed in fighting overnight in the town of Ilovaisk near the main regional hub of Donetsk. But Poroshenko said defiantly: "In order to have solid positions in peace negotiations, we have to be strong, to have the unity of the people, a strong country, a strong army." "We are capable of defending our sovereignty, our independence and our territorial integrity. Today we are fighting for the independence of Ukraine. Together we will win for sure," he added. Poroshenko went about preparing for a new election in October which he and others in the pro-Europe leadership hope will get rid of 'old guard' deputies in the pay of the former Moscow-backed president and produce a new coalition capable of pushing through basic reform and purging a system of corruption and cronyism. It was the ousting of then-President Viktor Yanukovich in February by street protests that caused a backlash from the Kremlin leading to Moscow's annexation of Crimea and the pro-Russian rebellion in the east. Poroshenko said he would soon announce the dissolution of parliament - possibly as soon as Sunday - paving the way for an October election. "I will be guided by the desire of the Ukrainian people. They want a 'reboot', they want a purging (of the system). The elections will be the best form for a purging," he said. A convoy of Russian humanitarian aid to the beleaguered city of Luhansk in eastern Ukraine remained stuck in no man's land at the border with Ukraine on Thursday, though Ukrainian border guards said they had begun to inspect it. The convoy of 260 trucks set out from the Moscow region early last week, but Kiev, suspicious that it could be a covert operation to somehow help the rebels, has insisted on scrupulous border formalities before allowing anything to come into Ukraine under supervision of the Red Cross. It was not clear when the trucks would be authorized to enter Ukrainian territory. The border crossing point at Izvaryne is under rebel control. Government forces, despite big losses in men and planes by separatists whom they say are armed with tanks, missiles and other heavy weaponry from Moscow, pressed forward on Thursday, a military spokesman said. It said the loss of the 16 interior ministry special forces members at Ilovaisk was serious. "It represents 25 percent of all deaths in the special forces throughout the entire anti-terrorist operation. This shows quite how fierce fighting is there," interior ministry adviser Anton Gerashchenko said in a post on Facebook. 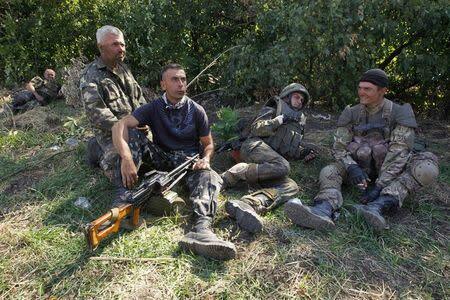 "According to commanders, in Ilovaisk they're fighting against well-trained Russian mercenaries," he said. Elsewhere, three refugees including a five-year-old child were killed when rebel gunfire hit their car as they fled the rebel stronghold of Luhansk, Ukrainian military spokesman Andriy Lysenko said. The United Nations says the fighting has claimed more than 2,000 lives on both sides.